Our Freshwater Stingray fishing tours in Thailand are amongst our most popular holidays allowing anglers to fish for what has widely been described as the largest freshwater fish in the world and possibly the ultimate freshwater fishing adventure. Fishing for Giant freshwater stingray in Thailand offers the visiting angler and sport fishermen the opportunity to fish for the awesome, monster Giant freshwater stingray at some of the worlds most beautiful and scenic fishing locations on the wild and remote tidal rivers of Thailand. 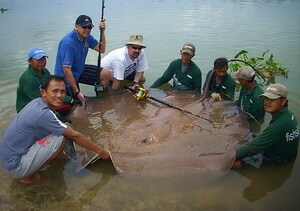 When fishing with the Fishsiam Ltd stingray fishing team in Thailand, anglers will be fishing with the very same record breaking fishing guides who have guided their anglers to successfully capturing literally hundreds of Giant Freshwater stingrays the pinnacle being a record breaking estimated 350 kg’s. Freshwater Stingray. Fishsiam Thailand will see anglers guided to and fishing in stunning and scenic fishing locations and following in the foot steps of explorers and adventurers such as Jeremy Wade from River Monsters and Zeb Hogan from the National Geographic Society. The Maeklong River in Samut Songkran and the Ban Pakong River in Chachoengsao province are Thailand’s premier freshwater stingray fishing destinations with both vast tidal rivers consistently producing Freshwater Stingrays to world record proportions to our friends and clients.Thailand Freshwater Stingray Fishing tours are also available on request at various other locations throughout Thailand for the more adventurous extreme fisherman. Anglers wishing to do battle with the amazing Giant freshwater stingray can now fish for this incredible giant freshwater monster fish species on daily trips to both the Maeklong River and the Ban Pakong River. Our two day fishing trips to both tidal rivers allow anglers visiting Thailand and Bangkok the opportunity to fish for Freshwater Stingrays on daily fishing trips starting in Bangkok.Anglers fishing for freshwater stingrays in Thailand on our two day freshwater stingray fishing tours are picked up at their Bangkok hotel before being transported to the tidal river of their choice. After a short transfer by air conditioned vehicle anglers will arrive at either the Ban Pakong or Maeklong River and be greeted by our team of professional fishing guides. Anglers choosing the two day Thailand Freshwater Stingray Fishing tours will board a local traditional fishing boat (longtail) equipped with life jackets and a three to four man crew of pro stingray fishing guides. Anglers fishing the Thailand two day Freshwater Stingray fishing tours will fish for freshwater stingrays at various areas of their chosen tidal river under the expert guidance of Fishsiam stingray fishing guides. The Thailand Freshwater stingray fishing tour allows fishing with 5 baits from one 30ft boat fitted with large net and is suitable for one or two anglers fishing together (weight limit 200 kg). Whilst Freshwater Stingray Fishing Thailand anglers will be equipped with strong 80-120lb stand up rods (Okuma or similar) fitted with heavy duty two speed multipliers (Okuma or Shimano). When Freshwater Stingray Fishing Thailand anglers will experience epic battles with prehistoric freshwater predators that will test their angling ability and stamina to the absolute limit!In the event of hooking into a monster Freshwater stingray anglers will be coached and assisted throughout the whole battle by our team of experienced stingray fishing guides.Whilst fishing for freshwater stingrays in Thailand anglers can be confident that they are fishing with the world’s most successful freshwater stingray fishing guides who have accounted for over two hundred different captures of Giant freshwater stingrays in Thailand. Battles with this most awesome of monster freshwater fish species are regularly played out over a period of several hours requiring several anglers to take turns in fighting the monster stingrays.After enduring a long protracted battle possibly lasting several hours and finally catching a Giant Freshwater Stingray your stingray fishing guides will make the stingray safe by wrapping the dangerous and poison coated barbs against the tail of the stingray with a thick bandage rendering the stingray harmless. 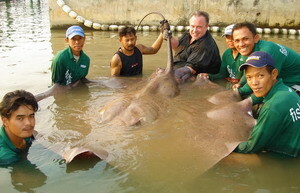 Freshwater Stingray Fishing Thailand allows the travelling sport fisherman the unique opportunity to fish for freshwater stingrays reaching world record proportions in the wild and natural surroundings of two of Thailand’s most remote and unexplored tidal rivers. Whilst fishing on our Freshwater Stingray Fishing Thailand two day fishing tours anglers we may be accompanied by veterinary scientists from Chulalongkorn University in Bangkok who will conduct various scientific examinations of any stingrays captured for their ongoing freshwater stingray research program. During our many freshwater stingray fishing trips in Thailand we have found Giant freshwater stingrays to be catchable all year round given the correct planning and preparation. We have found that full moon weeks are a particularly productive lunar phase which offers extremely good tides and favourable water conditions in which to catch freshwater stingrays. 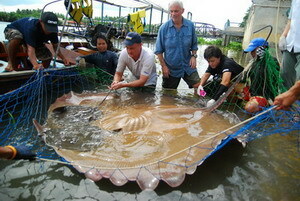 Our two day Freshwater Stingray fishing tours are priced at a competitive introductory rate and although not quite as productive in numbers of fish as our advanced stingray fishing packages still offer the visiting angler the best possible chance to catch monster freshwater stingrays in Thailand at an affordable price. Please note that the duration of our daily fishing sessions is 8 hours and that we observe a 3 fish limit in an attempt to impact fish stocks in the Maeklong River stingray research area as little as possible. Fishing times may vary at each river and we advise anglers to contact us before booking our daily freshwater stingray fishing trips so that we can access the best possible dates and fishing options for your Thailand freshwater stingray fishing trip. If you need anymore Information regarding Fishing or Fishing Holidays in Thailand please Contact Us using the button below.